Trastuzumab's targeted therapy has become a stronghold for human epidermal growth factor receptor 2 positive breast cancer patients. This humanized monoclonal antibody binds to the extracellular juxta-membrane domain of HER2 and inhibits the proliferation and survival of HER2 dependent cancer cells. The ways by which this molecule exerts its action have been partially elucidated but several new mechanisms are being constantly identified. Several new agents are being introduced that interfere with HER2. Several new immunotherapy strategies are being introduced in order to direct the immune system against cells and tissues that aberrantly overexpressed HER2. We review the strategies currently adopted and those suggested against HER2 expressing tumors. HER2 (Human Epidermal growth factor Receptor 2) is a tyrosine kinase receptor of the family that includes HER1 (EGFR), HER3 and HER4. This receptor mediates cell differentiation and proliferation in both embryonic and adult tissues. More than 30 ligands have been identified that bind epidermal growth factor receptor with the exception of HER2, which is the only deaf member. HER2 over-expression can therefore induce transformation in a ligand independent way . The HER2, also known as neu or c-erbB-2 , is a proto-oncogene located on the long arm of human chromosome 17 (17 q21-q22) that encodes a protein of 185 kDa [1, 2]. HER2 activation induces cell proliferation, migration and differentiation. Furthermore HER2 is involved in an anti-apoptotic mechanism and in the production of vascular epidermal growth factor (VEGF). All these activities are mediated by two intracellular pathways which include PI3K and MAP-kinase . 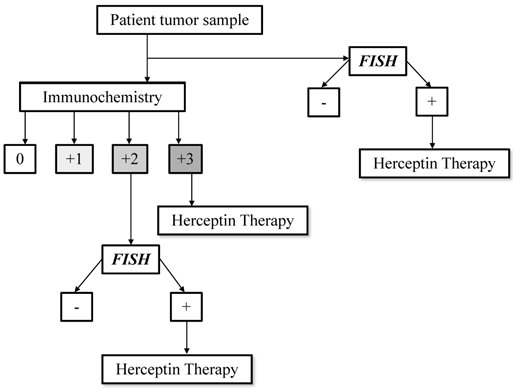 In human tissues HER2 gene amplification level and protein overexpression can be tested by Fluorescence In Situ Hybridization (FISH) and/or immunohystochemistry (IHC) respectively, according to the guidelines of the American Society of Clinical Oncology (ASCO) and College of American Pathologist (CAP) (Figure 1) . Recently some authors advocated the use of mRNA dosage as a more adequate diagnostic tool . The incidence of HER2 receptor expression, evaluated by IHC in different neoplasms is reported in Table 1. A significant correlation between HER2 gene overexpression and lymph nodal metastasis has been identified in breast cancer. Furthermore c-erbB2 is associated with drug resistance . In the absence of specific targeted therapies HER2 gene amplification represents one of the most important negative prognostic factors in early and advanced breast cancer . Standard treatment for breast cancer patients includes surgery, chemotherapy, radiotherapy and hormonal therapy that are administered according to clinical, pathological and biological characteristics [13, 14]. Since 1998 the FDA has approved Trastuzumab for the treatment of recurrent HER2 positive BC patients. Emerging evidence from large phase III randomized trials have extended the indications of Trastuzumab to the vast majority of IHC triple positive or FISH positive HER2 patients. Briefly the results of the most relevant clinical trials are summarized in Table 2. HER2 testing algorithm. Modified from Hanna MW, Mod Pathol 2006. The ways through which Trastuzumab exerts its antitumor activity have not yet been completely unrevealed, however certain extracellular and intracellular mechanisms have been identified. By blocking dimerization, Trastuzumab interferes with the activity of the intracellular signaling activated by HER2 in healthy and mostly neoplastic tissues. This effect plays its role by inhibiting DNA damage repair, inducing cell cycle arrest and inhibiting tumor angiogenesis. Trastuzumab decreases expression of p21/WAF1 and promotes early escape from G1 phase inducing accumulation of DNA damage and apoptosis . This MoAb modulates the phosphorylation of p27Kip1 , protein involved in cell-cycle arrest in G1 phase . It decreases survivin levels with consequently reduction in apoptosis resistance . In addition Trastuzumab reduces VEGF secretion and therefore angiogenesis in neoplastic tissues. Trastuzumab plays its activity also through its antibody characteristics which affect the immunological control of neoplastic cells, islet and tissues. In recent years abundant evidences have demonstrated the pivotal role of the immune system on tumorogenesis and tumor progression in several different neoplasms [23-26]. Anti-HER2 MoAb activates both the innate and the adaptive immune system. The effect on the innate immune system, in particular Natural Killer (NK) cells, is mediated by Fc portion. In vitro and in vivo evidences have clearly demonstrated that this antibody is able to induce granzyme release with consequent tumor cells killing . In addiction the effect of IFNγ released by activated NK cells is potentiated by the intracellular anti-apoptotic effect mediated by STAT1 . A less intuitive but possibly important mechanisms are mediated by adaptive immune system. Trastuzumab-HER2 complexes are most rapidly internalized, thus HER2 undergoes to an increased intracellular degradation with a consequent production of HER2 epitopes. HLA class I molecules can be loaded with these HER2 fragment, allowing lysis of tumor cells by specific CTLs . So far, it has been reported that Trastuzumab is able to induce a long lasting immune response , reduce circulating T regulatory cells (Tregs)  and alter the balance between Tregs and Th17 . Lastly, apoptosis induced by NK cells generates apoptotic bodies which are easily fagocitated by APCs thereby increasing the number of specific antitumor circulating CTLs . It is therefore evident how Trastuzumab not only activates the adaptive immune system against HER2 but represents an effective tool that determines also epitope spreading. Mechanisms involved to Trastuzumab resistance are HER2 mutation, cross-talk among the other extracellular HER proteins that induces incomplete inhibition of target receptor , masking of HER2 proteins mediated by MUC1/MUC4 glycoprotein (MUC1/MUC4) , inhibition of insulin-like growth factor  and tensin homologue (PTEN) deficiency . A detailed description of all tyrosine kinase inhibitors which block the intracellular pathways activated by HER2 is beyond this review's objectives. As follow, this is a brief description of the most important and promising drugs that have been introduced both to increase the effect of Trastuzumab and to bypass the mechanisms of resistance. Lapatinib, a dual tyrosine kinase inhibitor (EGFR/HER1 and HER2), is the only targeted therapy other Trastuzumab approved by FDA for HER2-positive metastatic breast cancer patients. This small molecule works by competing with ATP for binding sites on intracellular portions of HER1/HER2 and targets the downstream ERK1-2 and PIK3-AKT pathways, which regulate cells proliferation and survival, respectively . The role of Lapatinib in different treatment settings (neoadjuvant, adjuvant and metastatic) is being defined by ongoing trials. Differently from Trastuzumab, Lapatinib stabilizes the HER2 receptor on the cells surface thereby increasing the effect of Trastuzumab and consequent NK activity. On-going analysis on the immunological effect of Lapatinib are currently carried out by our group. Some new agents such as tyrosine kinase (TKIs), VEGF and mTOR inhibitors, T-DM1, alvespspimycin (HSP90 inhibitor) and poly ADP-ribose polymerase-1 (PARP-1) inhibitors seem to have a theoretical benefit, but results on clinical trials that can define a role in treatment of Trastuzumab-resistant BC, are still unavailable (Table 3, Table 4) . Pertuzumab EGFR/HER1, HER2, HER 4 Phase II ovarian, NSCLC, breast and prostate ? The relationship between cancer, cancer treatments and the immune system is extremely complex. Oncological procedures can activate or modulate an immune response [40, 41]. Furthermore the immune effect of different treatments depends on the timing of administration [25,42]. Researchers world-wide are investigating several new families of antigens in female tumors [43-46]. HER2 is one of the most studied targets for active immunotherapy. Several highly immunogenic epitopes have been identified; furthermore some interesting non randomized clinical data have strongly suggested a clinical efficacy when anti-HER2 peptide vaccination is carried out in a particular setting . To be effective, simple peptide vaccination requires to be administered in patients with a competent immunological system. The immune system of women with high tumor burden suffers from an immune suppressed status especially due to a high proportion of regulatory T cells (Tregs) . For this latter group more complex strategies are required in order to guarantee an immune effective response. Currently some trials have been carried out using E75 and GP2 HER2 peptides. There are strongly suggestive data to demonstrate a synergistic effect between peptide-vaccination and the use of Trastuzumab . More complex methods to induce a immune response include the use of fusion proteins primary constituted by a combination of multiple highly antigenic HER2 epitopes fused to the Fc domain of human IgG1. The rational of this approach is to specifically load the APC expressing the Fc receptors with the HER2 antigen, increasing antigen uptake, processing and epitope presentation. A third step forward has been developed in a pre-clinical setting using micro-vesicles derived from HER2 transfected cell limphoblastoid cell line carrying HLAI/peptide complexes and co-stimulatory molecules. These vesicles can be utilized to pulse dendritic cells (DCs) and achieve very potent active anti tumor immune responses . Both these approaches can be employed despite the HLA haplotype of the patients, in fact DCs are loaded with long domain of HER protein, thus enabling the DCs to generate a patient tailored repertoire of HER2 epitopes. Recently DCs therapy have been approved by FDA for the treatment of prostatic cancer [50, 51]. One of the most recent avenues that are being pursued is the use of DCs. Cell therapy remains extremely complex and the quality of cells produce strictly depends on methods and materials adopted . Currently some preliminary experiences on DCs-vaccination pulsed with HER2 peptides are present in literature. Of our interest will be the results of phase II randomized trial which will evaluate the safety and indirectly the immunological efficacy of two DCs vaccination administration strategies. HER2 currently represents the most important biological target in the clinical practice for breast cancer patients. Trastuzumab plays its role both through immunological and intracellular mechanisms. Currently new drugs that target this receptor or its intracellular pathways are available and already employed in clinical settings. On the other hand, HER2 targeting strategies exert an important side effect on immunesurveillance, activating anti HER2 specific immune response and enhancing epitope spreading. The integration of immune vaccination strategies within the standard therapeutic framework can be an optimal and an efficacious approach to induce and maintain a long lasting anti-tumor immune response. We would like to thank Ministry of Education, Universities and Research (Italy) and the Italian Association on Cancer Research (AIRC).